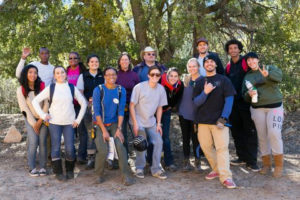 The San Gorgonio Staff come from all different backgrounds and bring a wonderful array of life experiences. Their formal educations range from high school graduates to Master Degrees. They do have several things in common. They are passionate about inspiring students to learn, love and respect the earth, as well as each other. They are all excellent role models. The core staff has trained them well and they are instilled with the knowledge and confidence to give every student and teacher a very rewarding week. They are the epitome of a highly disciplined, respected team. They all know what a difference they are making and they enjoy being with kindred spirits. Visiting teacher and students consistently give them excellent reveiws week after week.